Click and drag H or G to change the line of reflection. Select any point of the preimage to change the shape. Checking the ''Line Segments'' box will show line segments between the points on the preimage and the points of the image. Checking the ''Distances'' box will show the distances from each point to the line of reflection. 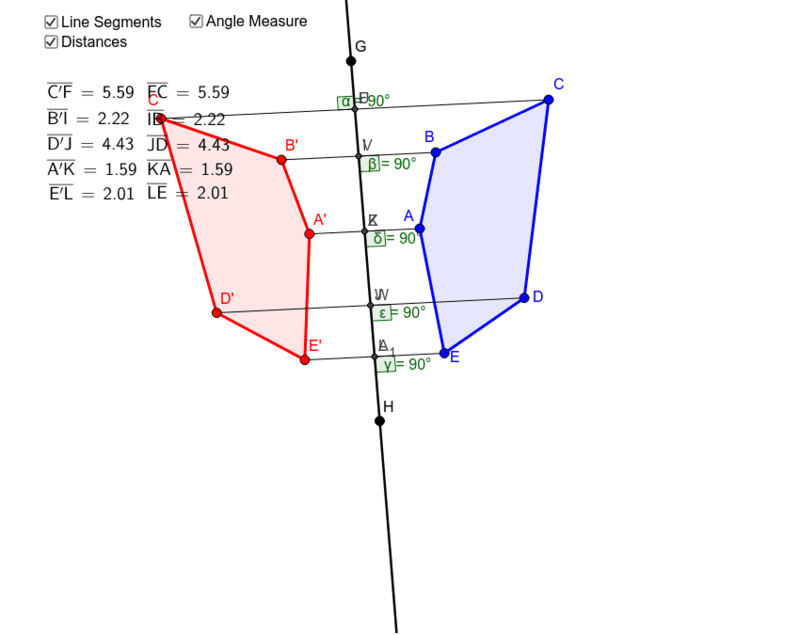 Checking the ''Angle Measure'' box will show the angle measure between the line of reflection and the line segments connecting the corresponding vertices of the preimage and the image. What do you notice about the relationship between the line segments connecting the points, and the line of reflection? What do you notice about the distance between the points and the line of reflection? What do you notice about the angle measures between the line of reflection and the line segments connecting the vertices of the image and preimage? Do these relationships change if the shape or line of reflection changes?